Nestle's permit to pump more water almost went unnoticed. State now says full public review coming. Nestle and other water companies have permits to pump water that will be bottled and sold. Nestle owns a water bottling plant in Stanwood, Michigan, north of Grand Rapids. It bottles spring water for its Ice Mountain and Pure Life brands. The company wants to increase the amount of water it pulls out of the ground at one of its wells. The well is about 35 miles north of Stanwood in Evart, Michigan. To do that, it needs a permit from the Michigan Department of Environmental Quality, and the public is supposed to weigh in on whether the company should get that permit. But a lot of people didn’t hear about it – until it was almost too late. This issue had flown under most people’s radar until Garret Ellison at MLive published a story about it last week. The DEQ said it had received zero comments from the public until that article was published. It was published three days before a 45-day public comment period was about to end. Carrie Monosmith is the chief of the environmental health section for the DEQ’s drinking water office. The public comments go to her. Last Friday she told us that since Ellison's piece was published, they had heard from a lot of people. "As of this morning we have received over 1,700 e-mail comments," said Monosmith. "We're pretty swamped right now." Even the environmental group that had fought a long-protracted legal battle with Nestle, Michigan Citizens for Water Conservation, hadn't heard about the permit application. The group wasn't aware of Nestle's new plans until being contacted by MLive. The Nestle proposal was published last month in the DEQ Environmental Calendar, a bi-weekly clearinghouse for permitting decisions, new administrative rules and other official notices that is not widely read by the general public. Monosmith says publishing in the online MDEQ calendar is typically all it does. She says they don’t really have a procedure beyond this for notifying the public. "This is the first time we've been hit real hard with this with this thing. So I can tell you going forward we will have a procedure..."
"This is the first time we've been hit real hard with this thing," said Monosmith. "So I can tell you going forward we will have a procedure that will have a public comment period. We will likely always have a hearing and we will likely publish information that public comment period is available in a newspaper or some other main source for the media." So, at least for this division that handles groundwater withdrawals, this experience could bring about some change in how they handle public notice. They’ve extended the public comment period for Nestle’s permit until March 3, 2017. And they are also planning to hold a public hearing on Nestle's permit in 2017. They are looking for a suitable location for that hearing now. You can find out how to comment on the proposal here. The Nestle water bottling plant was quite a controversial issue when it first started in the early 2000s. Under Michigan law, water bottlers don’t have to pay for the water they pull out of the ground. It’s free to them to pump and sell. Nestle's long legal battle with Michigan Citizens for Water Conservation concluded with a settlement in 2009. 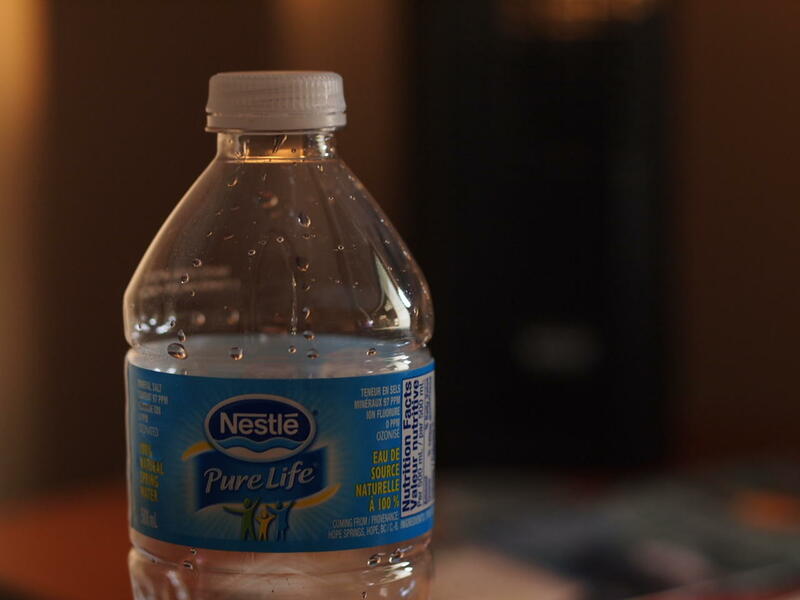 Nestle had to put a cap on what it could withdraw from a well in Mecosta County. Now it's back at another well, wanting to increase what it pumps. The permit application states that the company wants to go from taking 150 gallons per minute to 400 gallons per minute. But, in 2015, the DEQ already approved a 100 gallons per minute increase at this well in Evart. So the company has approval to pump at 250 gallons per minute now. This application, if approved, will allow them to pump 400 gallons per minute. Arlene Anderson is Nestle's natural resource manager for the Midwest region. She says the company has been preparing for this expansion. "We've done extensive monitoring. We have well over a hundred monitoring points that we've monitored for over 16 years including groundwater, wetlands, aquatic life, temperature, springs -- a very extensive database," says Anderson. "We're very confident that this can sustain 400 gallons a minute without adverse impact," she says. But now that people have discovered what Nestle wants to do, they are asking the state for more time to review the plan to verify Nestle’s claims. Not everyone pays attention to DEQ’s online environmental calendar. That’s where a lot of divisions publish pending decisions or proposals for permits. Jim Olson is president of the environmental group For the Love of Water. And he was the lead attorney in that lawsuit against Nestle more than a decade ago. Olson says Michigan used to have a robust and open public review process for things like this, but he says that’s changed. Olson said it started with former Gov. John Engler. Engler split up Michigan's Department of Natural Resources. Two agencies were then created: the MDEQ and the MDNR. "... there's been a whittling away of a tradition of public notice and public participation..."
"And part of that reorganization, that split, got rid of commissions with hearings and public notices for air, water -- all kinds of decisions like this. That was the first whack at the historic, and long tradition of Michigan having solid public notice in newspapers and information to various people and full disclosure of information and hearings and review processes and rights of citizens to go to water commissions and air commissions to ask questions," says Olson. "So we had a very effective open, vigorous review system that ensured that the decisions, even if somebody didn't agree with them, have their day in, you know, in the open sun of public review. And that was a good thing .. and so there's been a whittling away of a tradition of public notice and public participation," says Olson. We talked to people who work within the air quality and water resources divisions at DEQ. They said how they notify the public can vary by division. And even within divisions. Some notices are published in the paper. Some are just on the online calendar. And some permit decisions never go out for public notice. It all depends on how each division handles it. We're told the department is reviewing how it handles public notices, and changes could be coming. *This story was last updated at 11:40 am on 11/22/2016.